Spicy Chipotle Chickpeas with Siverbeet recipe by Jennier Iserloh. 1 bunch siverbeat, cut into 1 ½ cm thick strips. Include stems; cut on diagonal into thin slivers. Rinse quinoa under cold water. Place it in medium saucepan with 2 cups of water. Bring to a boil then reduce the heat to low. Cover and cook until the quinoa is tender, 15 to 20 minutes. Remove from heat. Heat a large stockpot over medium heat. Add the oil, leek and garlic. Cook, stirring often, until leeks soften, 3 to 4 minutes. Add the chickpeas, tomatoes, chillies and tomato paste. Bring to a gentle simmer over medium low heat. Cook covered until sauce cook down, 15 to 20 minutes. Add silverbeet and spinach; cover and cook until silverbeets wilts, 1 to 2 minutes. 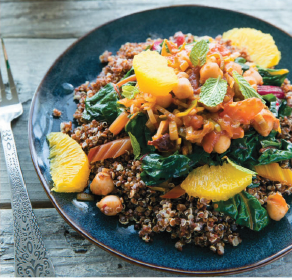 Serve over quinoa, garnished with mint leaves and orange wedges. 322 calories, 11g fat ( 1g saturated ), 46g carbohydrates, 11g fibre, 12 g protein, 507mg sodium. End.